I hear more often from my daughters than my sons, maybe it’s a girl thing. They have more words to give than their brothers. Today I heard from one of my daughters about eight or ten answers to prayer she had over the last week. She is a newlywed in a new neighborhood with lots of kids around. They’ve discovered the hours when she’s home. She has a heart for kids. So, one of her prayer requests is that she could get some extra food without spending more at the grocery store so the kids can have a snack. Sunday night our church had a worship service and a healing ministry if God wants to bless in that manner. I always invite her and her husband to come out for it if they can. They don’t live nearby, so I’m not sure if they’ll make the effort or not. They made it this last Sunday. They got treated to dinner by his folks at a restaurant, so after our service when a group of people wanted to attend a local pizzeria, I told them if they weren’t hungry they could join us and just have a drink. She wanted to visit with everyone, so they agreed. When my pizza came without the right crust or the right toppings, I began to eat it, but I did say to one of the ladies that it got all goofed up. She told our waitress that we needed a corrected pizza. Then I noticed they never delivered the fourth pizza. If we bought two at a time, we saved nine dollars on the price of the fourth pizza. The waitress realized she wrote the order down and never gave it to the cooks. So, she put the order in after we were full and told them to just box it up to go. I offered my daughter and son-in-law the leftover pizza and our friends didn’t want the fourth pizza, so she and he left with a full pizza and at least a half pizza, if not more for no cost to them. That was one of our daughter’s answers to prayer. She had story after story of God giving them things they needed this week, some just in time. My other daughter called with a few answers to prayer this week as well. My sons call with praise reports on a less regular basis because I hear from them less anyway. That’s the way it goes sometimes. My husband was quick to point out the word suppose in that verse. “This is an exaggeration,” he said. I know that, but it’s one of my favorite verses. The miracles and teachings Jesus gave in the New Testament provide such food for thought and to imagine that there were so many more we’re not aware of from the Scriptures, it boggles my mind. What a good God we serve. I borrowed a book from another library in our system called Just Write: Here’s How! by Walter Dean Myers with the afterword by a co-author of his in the tome Kick: Ross Workman. Mr. Myers received a National Ambassador for Young People’s Literature for this book and he’s a New York Times Bestselling Author of Monster. Near the end of Just Write: Here’s How!, readers can read of the many writers’ awards which he earned! The writing book was intended for Young Adults and is such a clearly written book on the craft that I’m tempted to buy it. He wrote on a variety of subjects and historical events over the years. The list of all his books from the very beginning in 1969 until 2012 took seven pages to compile! What a prolific writer. As I read his book, I felt encouraged to use the gift of writing for the benefit of others. He also mentions that writing helps the author navigate through life as they learn about people and other cultures and other social classes within the same country. When I considered that Jesus told people to repent for the kingdom of God was near, (Matthew 4:17), it seemed clear He knows that young people test their limits, even in unsafe ways sometimes. I don’t think He would tell people to repent if they couldn’t turn from wicked ways to wholesome ways. If you’re a writer from teen years on up, I think you’ll glean something from this book, even if you’ve written for a long time. 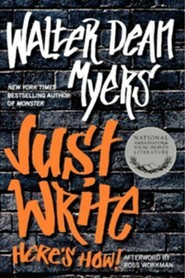 Walter Dean Myers tells it like it is in the world of publishing: Hard work and revision and joy and purpose in penning words for readers. I appreciated the personal examples of the techniques of the craft that he shared as well. My husband preached a little from Hebrews 10 on Sunday with a selection from Genesis 2 where God said it wasn’t good for man to be alone so He made woman from Adam’s rib, a helpmeet for him. By faith, Christian and Jewish believers accept Genesis’ account of God creating the world by speaking it into being. “…things which are seen were not made of things which are visible,” as referenced above in Hebrews 11:3 and here in Genesis 1: 1-3, (ESV): Gen 1:1 In the beginning, God created the heavens and the earth. God continued to speak the Creation into being in the beginning of the book of Genesis. “We hear you, but we are praying,” we responded. I think she wondered if we’d lost our senses. I wrote this man with cancer about our experience with sickness to encourage him to hold onto God’s word even in the midst of a bad report. I think as people exercise their gift of faith and see God’s faithfulness, it helps faith grow. But when our son battled for his life for thirty days, my husband and I believed together some of the time and many times when my faith floundered he felt confident that God would heal our son and when he struggled to believe, my faith in God buoyed him up. As it turned out, God heard our prayers and those of family and friends. A week before he came home from the pediatric Intensive Care Unit, my husband felt sure God was directing him to tell our church to stop praying for healing, but to thank God for the healing before we saw it happen. Someone else told him they had the same impression from God, which he received as confirmation, before he spoke to the congregation. God answered all those prayers and chose to restore our son’s liver and destroy the virus’ power. Believers in Christ are to “meet together” not only for worship and the reading of the Word of God, but also in casual gatherings so they can get to know one another. They need to learn to get along together and to speak the truth in love to one another if someone needs correction. They need each other if some should suffer lack. Then the other believers can learn of their predicament and share from their plenty. There are lots of reasons for believers to assemble. Jesus sent the disciples out in pairs to preach the gospel, to deliver people from demonic influence, to lay hands on the sick so they would recover. Well, anyway, we need each other, if it’s to keep from being discouraged, or to keep from being lonely, God made mankind to rely on one another, as risky as that may seem if you’ve been hurt. In addition, we need God to direct our paths and to trust Him to take care of us as we develop friendships and relationships. May God bless you and protect you and lead you in paths of righteousness. My husband and I went to see “Ben-Hur,” the new movie produced by spouses Ramona Downey and Mark Burnett, made by Metro Goldwyn Mayer and Paramount Pictures. It stars Jack Huston as Judah Ben-Hur, Toby Kebbell as his adopted brother, Messala; Morgan Freeman as a sheik/horse trainer who owns chariots for racing and winning bets; Nazinin Boniadi as Ben-Hur’s love interest; Rodrigo Santoro as Jesus Christ; Ayelet Zurer as his mother, Naomi; Sophia Black D’Elia as his sister, Tirzah; and Pilou Asbaek as Pontius Pilate. Timur Bekmambetov directed the epic film. The movie spoke about family love and loyalty and lots more. An action film filled with conflict and violence and poignant tenderness. Jesus Christ is a minor character in the movie and for once He’s not portrayed as a “pretty” man, weak. In the movie He never speaks of hell, which was a term Jesus didn’t shy away from, and repentance as well. I found the movie stirred my heart. I would have preferred less violence, but I always feel that way when I view action movies. I expected to write this blog last night, but my computer kept saying there was a problem with the internet. My husband checked our connection on his computer, and it worked perfectly. Sometimes I feel God allows me to face interruptions because the timing isn’t right, or because I’ve made a grammatical error in a query letter, for instance. A no-no for a writer! 🙂 So I gave up and figured I’d type another day. Everyone smiled and I tried to, but deep down inside I knew it wouldn’t happen. Last week or so ago, his wife needed to take a day off for a medical reason in the family. She lost a day at work, so now she can’t make the trip in November. “Go without me,” she said. “No, I’m not doing that,” he told her. Have you ever known something was going to happen? When we were young and poor, having moved to Texas years ago to take advantage of a healthy job market, a local radio station offered a cash prize for the twelfth caller, or fifteenth caller. I don’t remember. What I do remember is waiting a moment or two with a solid certainty that I’d be the winner, and I was! The only furniture we owned was a used inexpensive kitchen set and a baby crib. My husband and I had purchased a foam mattress from a store that sold foam and we slept on that on the floor. My sister-in-law’s family felt bad for us, so they’d provided us with the radio. I was a Christian at the time, but I had put God aside for the most part. Yet He still blessed us. My husband worked hard and eventually we did get a couch and chair. One of the gifts of the Spirit is the word of knowledge. Now I’m not saying I had a word of wisdom or a word of knowledge, but I had a knowing, an unshakable knowing. I spoke to someone about this and they said everyone experiences this occasionally whether they believe in God or not. That may be true. I enjoyed reading 1 Cor. 12 and seeing the list of gifts from God’s Spirit that He gives to believers as He wishes to do. Proverbs 8:1, (KJV) Does not wisdom call? Does not understanding raise her voice? Pro 8:4 “To you, O men, I call, and my cry is to the children of man. Pro 8:5 O simple ones, learn prudence; O fools, learn sense. Pro 8:7 for my mouth will utter truth; wickedness is an abomination to my lips. Pro 8:8 All the words of my mouth are righteous; there is nothing twisted or crooked in them. Pro 8:9 They are all straight to him who understands, and right to those who find knowledge. Pro 8:11 for wisdom is better than jewels, and all that you may desire cannot compare with her. Pro 8:31 rejoicing in his inhabited world and delighting in the children of man. Pro 8:32 “And now, O sons, listen to me: blessed are those who keep my ways. Pro 8:33 Hear instruction and be wise, and do not neglect it. Pro 8:34 Blessed is the one who listens to me, watching daily at my gates, waiting beside my doors. I felt certain God was talking to me today about choosing a television show over spending time with Him. I felt bad about that, so I’m not making the same mistake tonight. I decided to grab a rectangular paper off of the fridge with Proverbs 8:33-35 on it. I like posting Scriptures around the house. They remind me of principles I want to follow. Occasionally the Scripture is one I want to memorize. I love the idea of asking God for wisdom according to His wishes. I remember a Bible study teacher I had that asked God for wisdom on a continual basis for a time because she felt a need for it. I thought that was a good idea for me, too. There are times when people long to be alone. Away from crowds, noise, responsibilities, and even loved ones. When we’re alone and away from the television, computer, electronic devices, radios and phones we may stand a chance of connecting with God. As I’ve written before, Psalm 46:10: “Be still, and know that I am God: I will be exalted among the heathen, I will be exalted in the earth,” is one of my favorite verses. There are times when I was alone and I was lonely. Trying to get over the loneliness, I called friends or family, watched television, buried my nose in a book, ate something whether hungry or not, or went shopping. After none of those things lessened the loneliness one day, I began singing, “What a Friend We Have in Jesus,” a hymn from 1855, written by Joseph M. Scriven, with a copyright status of Public Domain. The composer of the music was Charles C. Converse in 1868. In the book of John, chapter 15: 1-11, (ESV) it says, “I am the true vine, and my Father is the vinedresser. Joh 15:2 Every branch in me that does not bear fruit he takes away, and every branch that does bear fruit he prunes, that it may bear more fruit. Joh 15:3 Already you are clean because of the word that I have spoken to you. Joh 15:4 Abide in me, and I in you. As the branch cannot bear fruit by itself, unless it abides in the vine, neither can you, unless you abide in me. Joh 15:5 I am the vine; you are the branches. Whoever abides in me and I in him, he it is that bears much fruit, for apart from me you can do nothing. Joh 15:6 If anyone does not abide in me he is thrown away like a branch and withers; and the branches are gathered, thrown into the fire, and burned. Joh 15:7 If you abide in me, and my words abide in you, ask whatever you wish, and it will be done for you. Joh 15:8 By this my Father is glorified, that you bear much fruit and so prove to be my disciples. Joh 15:10 If you keep my commandments, you will abide in my love, just as I have kept my Father’s commandments and abide in his love. All those years ago, I discovered that I am never alone. It has brought me great joy. Not that I don’t get lonely anymore, but it’s not often and when I do get lonely, I realize I need to read the Bible and talk to Jesus. That’s what I’m really longing for. I was spending some time with the Lord today and I thought He might have been leading me to Phil., chapter three. Paul starts out reminding us to rejoice in the Lord. When horrible things are happening, it may feel hard to rejoice, yet Paul wrote Philippians while in prison. One of my favorite sections of Scripture is Phil. 3:12-14. Php 3:12, (KJV), Not as though I had already attained, either were already perfect: but I follow after, if that I may apprehend that for which also I am apprehended of Christ Jesus. These are people I know, people that cared about their children. People that continually try to improve their parenting skills and their own characters may need to cry out to God for help as they interact with their children, but after the fact, if they goofed and they apologized to their child and tried to keep from repeating their wrong behavior, I say, with Paul, leave it in the past. It does no good to beat ourselves up. If we’re stuck in a mode that is harming our family members, we’d better get help and remove ourselves from the situation if things are escalating. That’s why I don’t believe in Evolution. Men and women are not animals; we are human beings not subject to instincts. We can make choices. Humans reason and worship God. Animals do not. Humans can control themselves and seek to know God. Well, if you haven’t read Philippians, it is a great book of the New Testament. The Bible is a book that never grows old. The more I read it, the more I see things I never saw before. Keep It Shut: What to Say, How to Say It, and When to Say Nothing at All by Karen Ehman, published by Zondervan, copyrighted in 2015 speaks about Joseph on p. 34. I’m looking forward to continuing to read Karen Ehman’s book. She’s interesting and I like Joseph from the book of Genesis. God gave him tremendous talents. He got placed as manager over Potiphar’s belongings. In Genesis 39: 5, (KJV) it says, “And it came to pass from the time that he had made him overseer in his house, and over all that he had, that the LORD blessed the Egyptian’s house for Joseph’s sake; and the blessing of the LORD was upon all that he had in the house, and in the field. As a young man, Joseph might have used some tact when talking about the dreams God gave him about ruling over the other family members one day. Unfortunately, he didn’t. In order to be placed over all of Potiphar’s household and business affairs, he must have learned to curb his tongue. He wasn’t married at the time and we learn later that Egyptians didn’t like to eat at the same table with Hebrews, in Genesis 43:32. So, it doesn’t seem he has any close friends. He certainly got to know God more during those trying times. He never curses God in the book of Genesis for his years of slavery and hardship. He’s an amazing person. I really enjoy reading of the life and times of those in the Bible, ordinary people serving an extraordinary and only true God, according to God’s Word. Hopefully, I learn from their foibles and their triumphs. I hope if I ever speak to people about God’s favor over my life that I would give God all the credit, as Karen Ehman mentioned in her book.